The Proper Marmalade Company Blog – Tagged "Kirsties Home Made Christmas"
Commonly asked Questions about cooking Boxing Day Chutney. Q: I have to take warfarin daily, and have been advised to avoid cranberries. Is there an alternative to cranberries that could be used in your recipes for people like myself? A: You can just leave out the cranberries and drop the sugar by 227g/8oz (this is an educated guess, before potting let a little cool and taste it, if not sweet enough for you return the sugar and bring back to the boil as the sugar will create a little more liquid) You won't get pockets of pink in the jar so it won't be as pretty but the strongest flavoured component is the apricot. If you wanted the occasional tarter pop in the jar then I suspect gooseberries could be substituted but they are out of season and I haven't tried it! 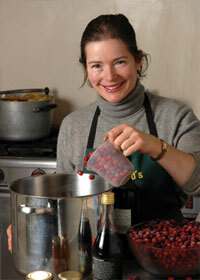 Q: Do I use dried cranberries or fresh – if fresh can you suggest where to buy them? do major supermarkets carry such a product? A: Fresh cranberries are in season now, you can buy them from most green grocers and supermarkets in the run up to Christmas. A packet usually weighs 340g. Q: I have had problems with it being too thick - or at least it is in comparison to the Kirsty's which looks almost liquid. Mine is chunky and you can clearly identify the apricots and other fruit. I couldn't get the naturally dried apricots so had to get the 'orange' ones instead. Any advice? A: The initial photo shot was of the cooking ingredients before the soaked dried fruit was added. Once all ingredients were added and brought to the boil (stirring to avoid sticking) it thickened quite quickly. If it is too thick for you return to the saucepan with more orange juice and bring back to the boil before re-potting. Q: I have had some problems with this recipe. There seems to be far too much liquid and it took a long time for the mixture to anything like resemble chutney – as I would have expected. A: The orange juice should be totally absorbed by the dried fruit before being added to the cooked mixture of onions, apples etc. The cider vinegar should be somewhat thickened by the breakdown of the apples and reduced by the cooking of the onions. when the sugar is added it will create some additional liquid which should quite rapidly thicken to the consistancy of a pouring custard while you constantly stir (otherwise liquid comes to the top as the solids drop and catch on the bottom). Stir as you fill the jars so that the liquid is well distributed (continuing the analogy custard packed with bananas). As you are using quite dry fruit it will continue to absorb liquid and thicken as it cools.